[toc]Eczema is an irritating skin problem that trouble people lifelong. Treatments and medicines relieve the symptoms but could not cure it permanently. It mostly returns after a few days of treatment with all its strength to make the life miserable all over again. Continuous itching and blistering of skin followed by bleeding are the symptoms of eczema. Until now, no research has confirmed the exact cause of this skin aliment. However, it has been studied individual with dry skin and weak immune system is more prone to eczema. Some people get this terrible disease soon after birth and suffer lifelong. As the exact science behind the disease has not been found, permanent treatments are not available. Steroid creams give temporary relief which last until the cream is applied. 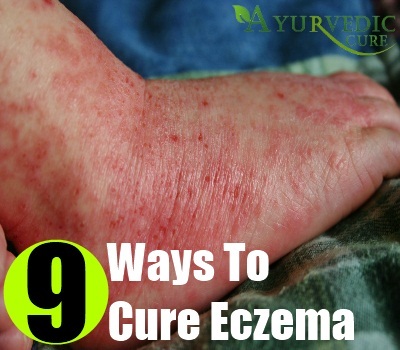 Eyeing the robustness of eczema, we have collected some information on natural cure of eczema to benefit our readers. These tips and remedies are simple and easy to follow at home. Try them to treat your eczema right at home. The best way to prevent eczema from getting worst is by moisturizing the affected area frequently. Dry skin acts like venom for eczema making you scratch it more. Repeated scratching cause bleeding and make it spread to the nearby area. That is why during winters, eczema is more difficult to manage. 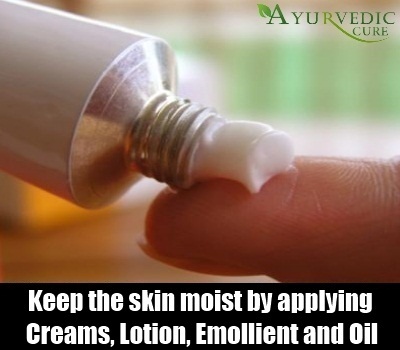 So, keep the skin moist by applying creams, lotion, emollient and oil. Emollient are easily available at pharmacies. Emollient has the property to lock the moisture inside the skin and prevent it from getting dry. It is the best treatment for people having extensive dry skin. Regular application helps to control the symptoms. Diet plays a huge role in skin health. Skin is the largest organ in the body. Whatever we eat is directly reflected on the skin. Skin also helps to excrete toxins through pores in the form of sweat. So, consuming foods that help to maintain gut and liver health is very important. Healthy digestive system will effectively excrete the toxin from the body along with urine. 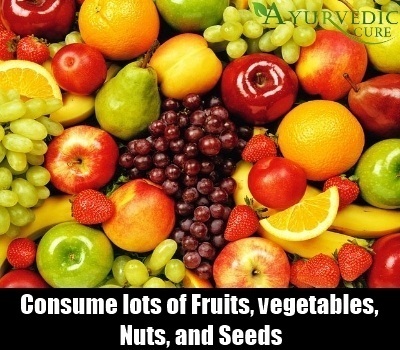 In order to ensure this, eat lots of fruits, vegetables, nuts, and seeds. Also, include foods rich in omega 3 fatty acid like salmon, chia, walnuts and hemp seeds. Cut down the intake of gluten by reducing the consumption of pasta, bread, cereals and processed carbohydrate rich foods. 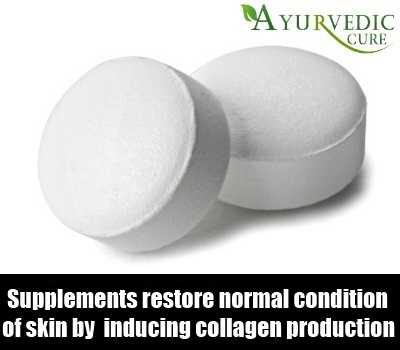 It is necessary to furnish your body with certain vitamins that are good for skin. However, most of the nutrients are present in the foods we eat in meals. But there are certain nutrients that are not furnished with the regular meals. So, we may need to take supplements to fight eczema. These vitamins include omega 3 fatty acids, vitamin A, D and E and gamma linolenic acid. Omega 3 fatty acid helps to improve dry skin condition and control inflammation. Vitamin A, D and E help to restore the normal condition of the skin by retaining hydration and inducing collagen production. Stress is the culprit behind many health problems. It is no surprise that it also affects skin. Therefore, it is ardently important to control stress as much as possible. Though stress is hard to control, you can take the help of alternative treatments to reduce stress like visualization and hypnotherapy. Other easy ways to reduce stress is meditation, listening to soothing music, taking enough sleep and yoga. Daily skin care products like shower gel, soap, lotions and creams directly interact with the skin. So, you need to aware of the ingredients present in the products as some products contain harsh chemicals that are extremely drying and cause irritation on the dry skin. 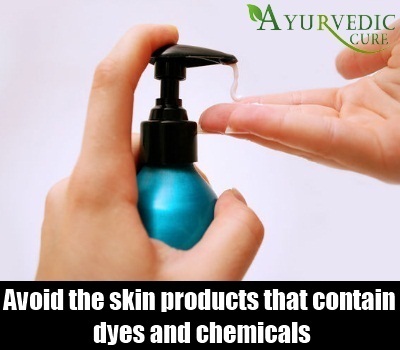 Avoid the products that contain dyes, perfumes, and chemicals like sodium lauryl sulphate and parabens. Sodium lauryl sulphate breaks down skin’s protein leaving open for the allergens to interact. Parabens are mostly found in all the skin care products and are known to cause skin irritation and even cause cancer. 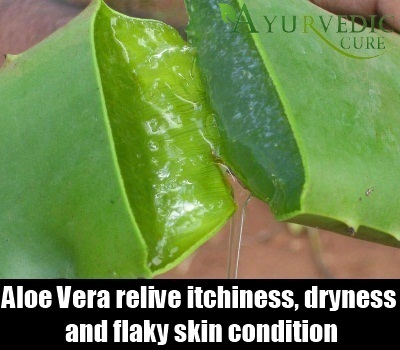 Aloe vera is used since ancient times to cure many skin problems like wounds, burns and dry skin problems. Its soothing and healing properties work to relive itchiness, dryness and flaky skin condition including eczema. It is better to use fresh and natural aloe vera gel extracted directly from its leaves than using the gel available in market. Market products may contain chemicals that could irritate skin. But do not over use the gel on skin as it may cause side effects. 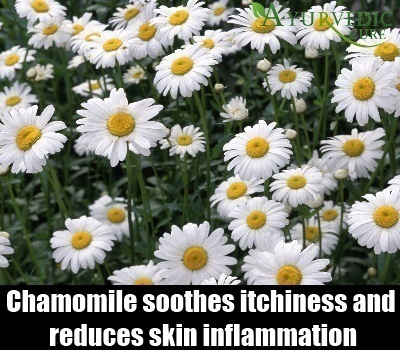 Chamomile is also a natural treatment for eczema like aloe vera. It also helps to sooth itchiness and reduces skin inflammation that is caused due to repeated scratching. You can use chamomile in a number of ways. Prepare chamomile tea by steeping dried flowers in hot water for few minutes. Then take a clean cloth and soak it in the tea. Place the warm compress in the affected area for 10 to 15 minutes. Otherwise, apply chamomile essential oil on the eczema directly or use it to take warm water bath. But test it in a patch of skin for allergy reaction as some people are sensitive to chamomile oil. Warm water bath can help to reduce itchiness, pain and dryness if taken with eczema-soothing ingredients. But make sure that the water is not too hot as it elevates eczema symptoms. Here are some tips to use eczema-soothing ingredients for warm water bath. Take regular uncooked oatmeal and sprinkled a few tablespoons on the bathing water before taking bath. Baking soda can be mixed with bath water to ease itchiness. Bleach is another ingredient that can be used to take warm water bath. Mix half cup of regular bleach with water before taking bath. Bleach helps to kill bacteria and helps to control the spread of eczema to the other part of the skin. As mentioned above, fatty acids are good for maintaining healthy skin condition. 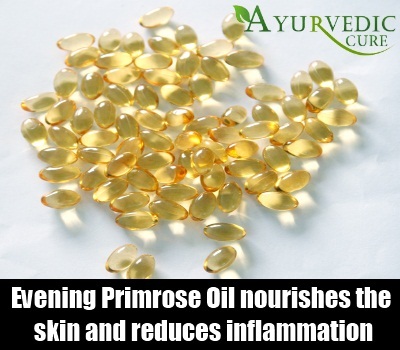 Primrose oil contains a rare fatty acid called gamma-linolenic acid which nourishes the skin and reduces inflammation. Evening primrose oil should be taken orally to control eczema symptoms. Its supplements are easily available in the pharmacies.